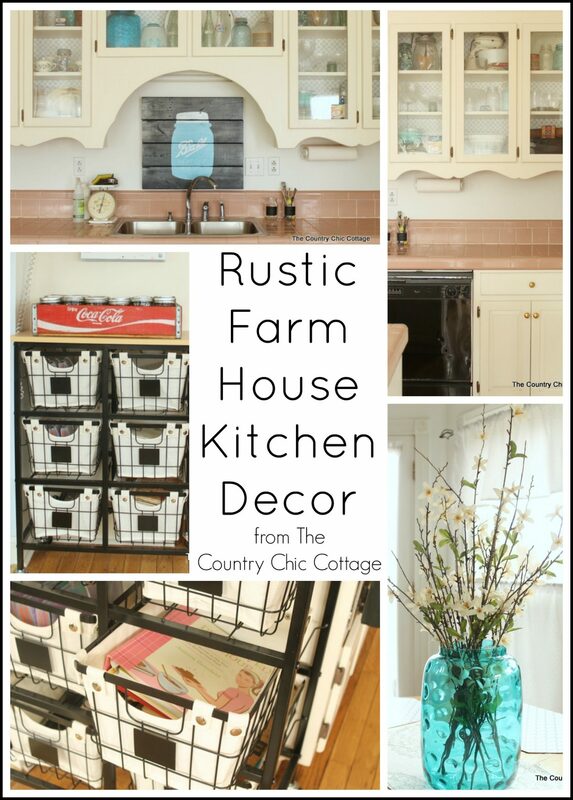 I am going to share with you some of my rustic farmhouse kitchen decor today. Plus you have a chance to win a $100 Walmart gift card at the bottom of this post. Finding rustic style at Walmart? Oh yes you can! This is part of a year long series of posts promoting the Better Homes and Gardens collection at Walmart. I have found so many great products both online and in stores and I am so excited to share even more of those with you today. Our kitchen is currently a work in process and I am taking baby steps at getting it updated. I have worked about every weekend since Christmas in this space and I must say I am loving the results so far. We have even further to go in this space but I love seeing the progress along the way. It is like a huge pat on the back! I will start with the cabinets and counters moving from left to right. On the left we have some storage next to the refrigerator. I am in love with those stacking galvanized bins. I actually found those on Amazon and they work perfectly for our home. You can find information on that Pottery Barn knock off canister as well as those chalkboard label jars by clicking on those links. The back wall is full of glass front cabinets. I love housing a variety of vintage items in them. I took shelf paper and applied it to foam core board then put it in the back of every cabinet. It was amazing what a difference this small change made. 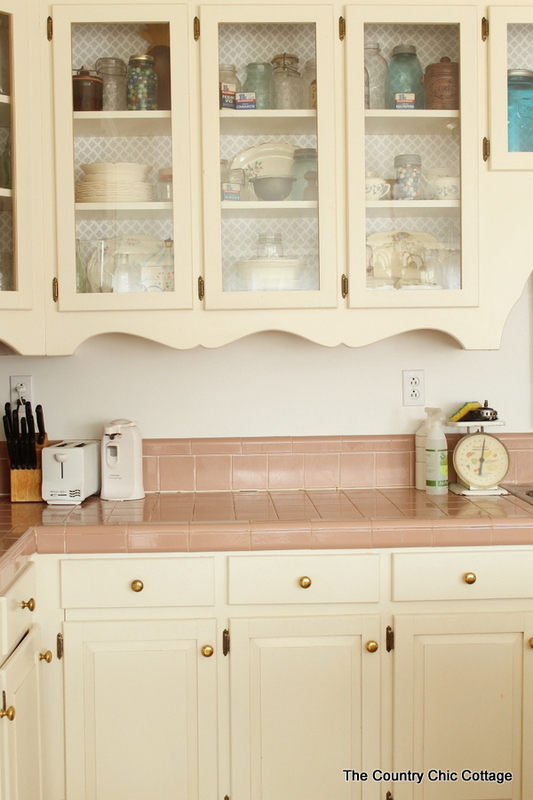 Plus it is a super affordable and non-permanent way to give your kitchen an update. 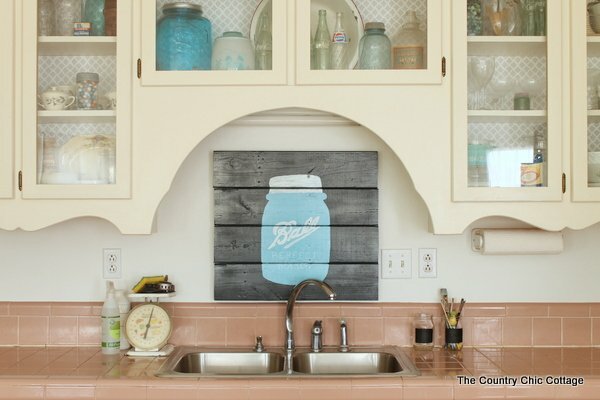 Above the sink I made a mason jar pallet sign and you can see how to make your own here. It is the perfect addition to this space. When you love jars as much as I do, this is a must! I also use a rustic vintage scale beside the sink to hold sponges and sink stoppers. More vintage goodies in the next set of glass front cabinets. I might like jars a little bit….maybe. Turning the corner, we have a small family command center where we keep papers and incoming mail sorted and (some what) organized). Zooming out a bit from that area you can see a few new pieces that I purchased from the BHG collection at Walmart. 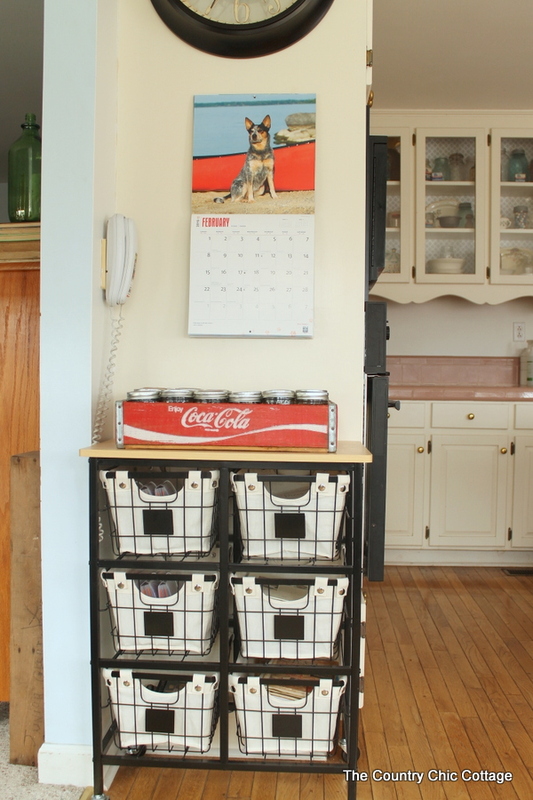 The Better Homes and Gardens 6-Drawer Wire Cart is one of my favorite pieces! And it is so super affordable at only $54.97! It was really easy to put together and it is very sturdy. On top, I have the mason jar hardware organizer that I made recently to store all of the hardware odds and ends in our home. 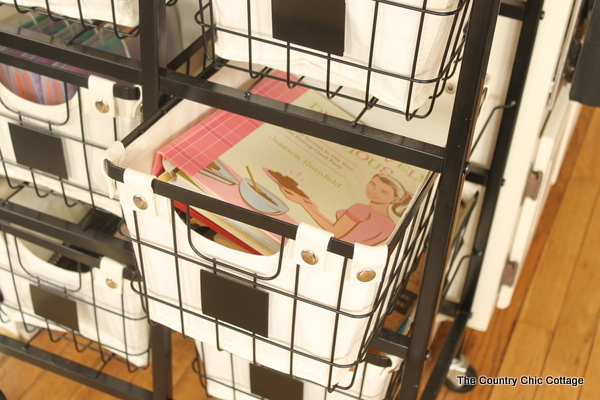 Inside of the baskets I have my cookbook collection. I plan to organize it some and write on each of those chalkboard fronts soon. Above the cart is the HUGE Better Homes and Gardens Silhouette Wall Clock . I am in love with the fact that this clock almost looks vintage! It is a large statement piece but y’all it is so light to hang on the wall! I love that! Next to that wall is an opening into our family room. I hung a variety of vintage and new items around this opening. I used a pair of BHG floating frames (not available online but check your local Walmart). 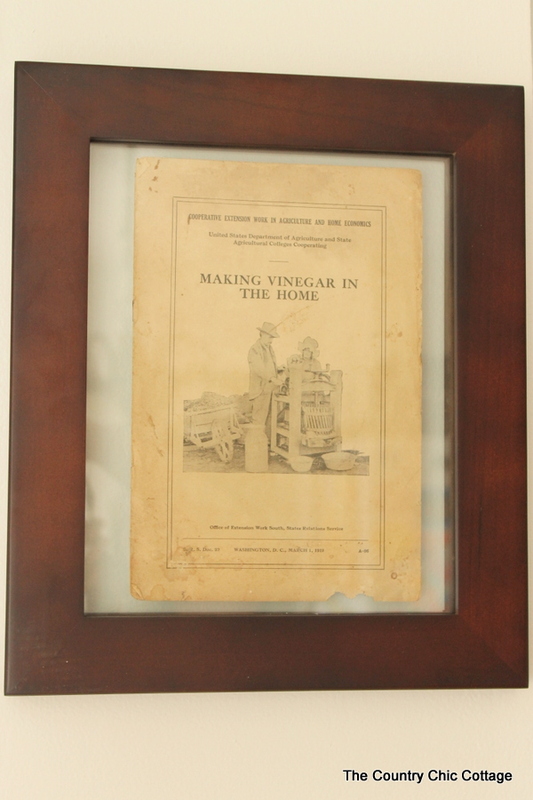 I framed some great vintage agriculture guides that I picked up at a yard sale. 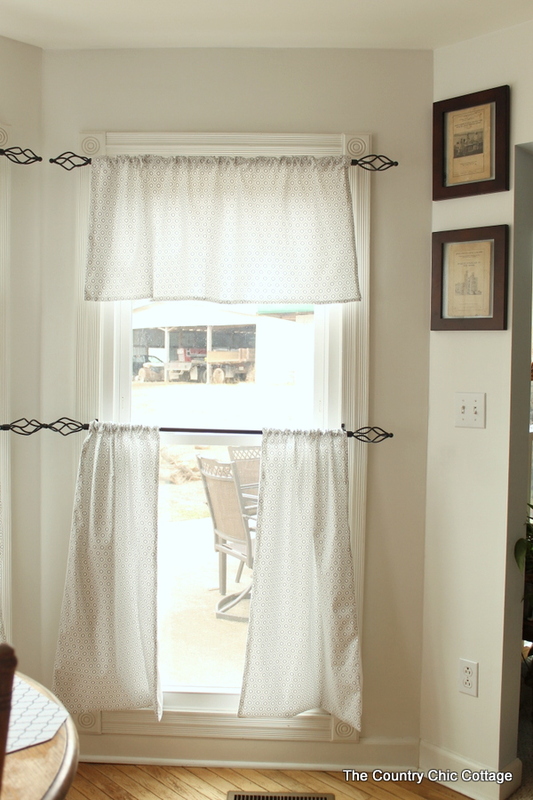 I made cafe curtains for the windows as well. I will have a tutorial coming up on how to make these in a week or so. Y’all stay tuned. The fabric for these is actually a Waverly print that is now available at Walmart. They have really gotten a great fabric selection lately at our store so y’all be on the lookout! Here is a wider view of our kitchen table area. Why yes I have a TON of windows in my kitchen! 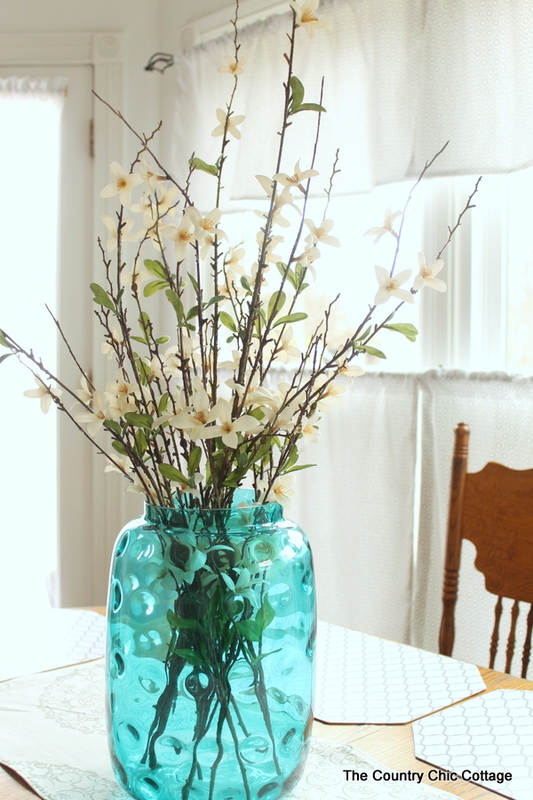 I picked up that jar in the center of the table from TJ Maxx and the branches are from Hobby Lobby. I actually made both the placemats and the table runner. They are both so super simple to make that really anyone can do it! The runner is stenciled with some metallic paint and it very rustic and imperfect which fits just right in this kitchen. You can follow along with the graphic below to see more about how I made the runner. The fabric is a white canvas material and I actually found a remnant at my Walmart. I just sewed a hem all the way around and stenciled on the design randomly. I had the HARDEST time finding placemats that would work in this room. I really needed something that I could easily clean with the kids using this table for everything from eating to homework to art projects. I came up with a super simple and affordable solution that looks amazing as well. 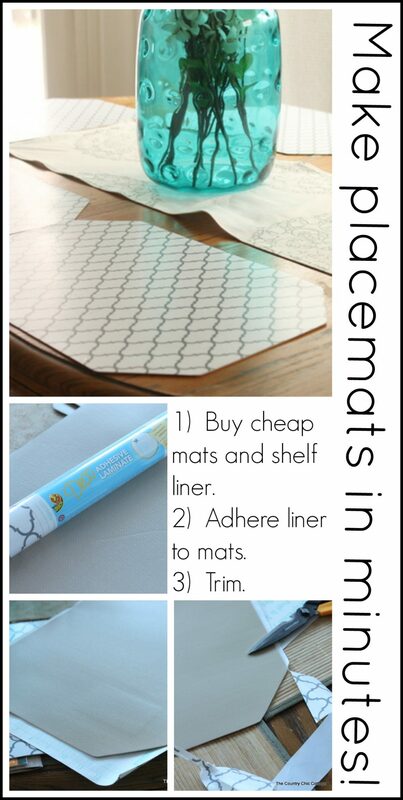 Grab just plain cheap placemats from Walmart along with a roll of shelf liner. Adhere the liner to the mats and then trim the excess. So easy and so far they are holding up so well! I hope y’all have enjoyed this tour of our kitchen as much as we are enjoying living in it! 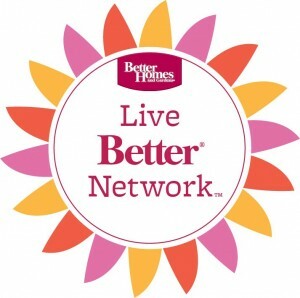 You can find the Better Homes and Gardens collection at your local Walmart or online. This post is sponsored by BHG for Walmart however all opinions and projects are my own. For more inspiration on using the products follow them on Facebook, Twitter, Instagram, and Pinterest. 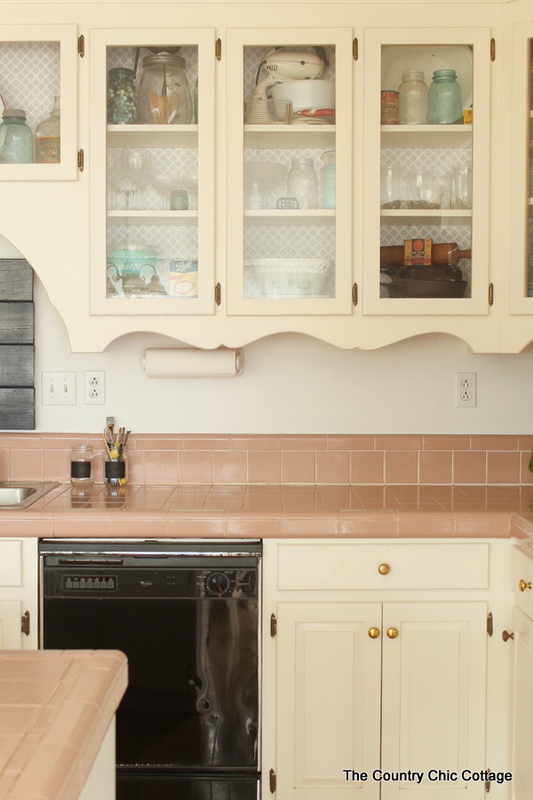 Loving the kitchen – all your touches and finds makes it look so inviting. 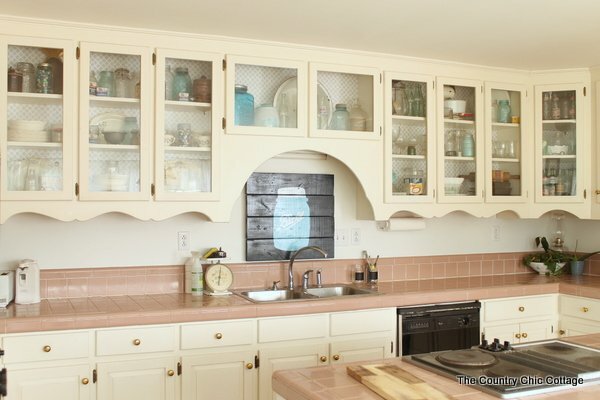 Angie – I love your glass front cabinets that house your collections! And that 6 drawer cart is going on my shopping list for this weekend!! Oh I like that 6 drawer wire cart too! 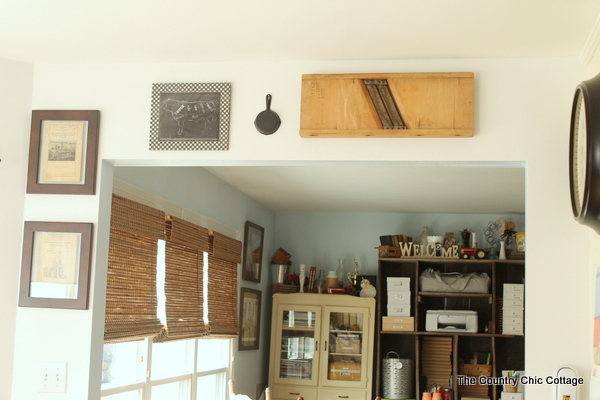 It’s one for the craft space in my house…but I love the idea of using it for kitchen storage! Your kitchen looks great! 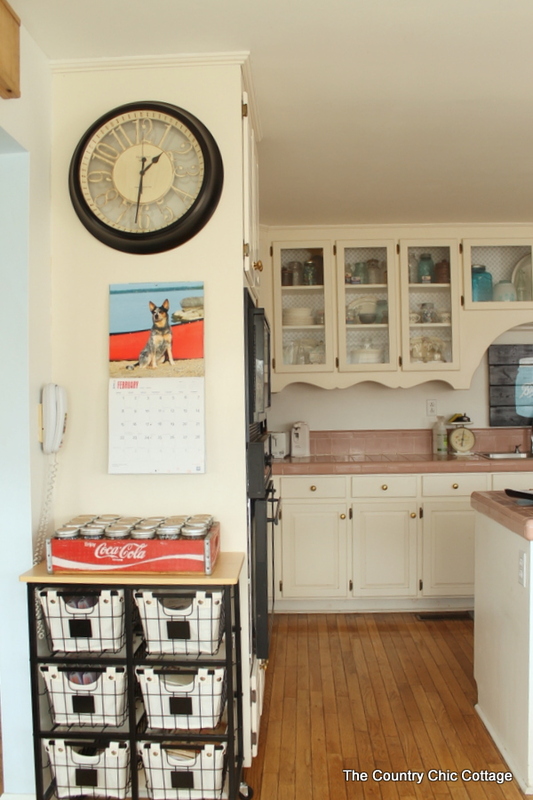 Love the Ball jar art above your sink, and that fantastic drawer cart! Your kitchen is GORGEOUS, Angie! My kitchen is about the size of a shoebox with one window ~ I’m swooning over yours and the way you have it decorated is farmhouse perfection. Love the wire basket especially – I could use that in my craft studio! Love it! The pallet sign is fabulous! The other details are great also, and it’s great to know you can find such stylish things at Walmart! That wire cart could be useful not just in my kitchen, but in several other places in my house! The kitchen looks amazing, Angie! I love those wire baskets! Absolutely love your ideas, thank you for sharing! I have a huge collection of jars and antique plates. I’ve been thinking of adding glass to the front of a few of my cabinets. Now that I see yours it’s a go. I love the idea of decorating the backs with foam board and shelf liner. I love to change things out! Enjoy your new transformation, and keep up the good work. Love the kitchen. All those windows bringing in natural sunlight is really great. Love your kitchen and thanks for the chance at the gift card! 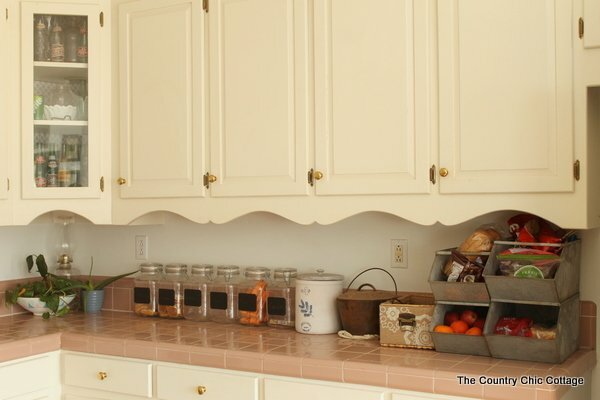 I am always looking for ways to contain the clutter on my countertops! Thanks for sharing. Angie, love your kitchen and all your goodies. Looks like you have a good sized kitchen. Quite envious of your glass fronted cabinets. I want to cut out centers of our cabinet doors to put glass in but it’s pretty cost prohibitive for us. The glass I want is way too much. Thought about buying plexiglass but that’s not cheap either, sheesh. Would maybe have to start out with just 2 or 3 cabinet doors at a time. 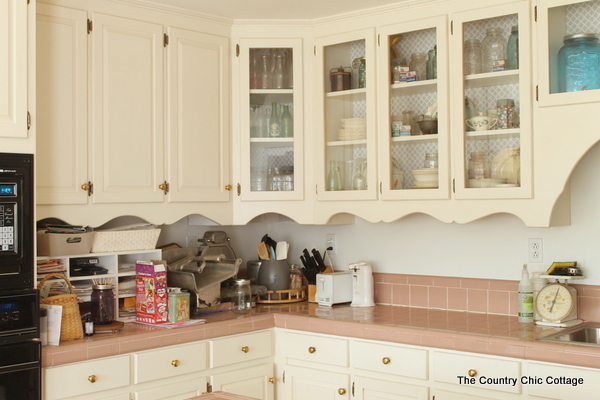 Was the glass in your cabinet doors when you bought your house? We have the cheapy vinyl cabinet doors that many mfg. homes come with. Hate them but it’s what we have so have to make do, painting them would help. Everything gets so dirty here have to have something in middle of doors, can’t leave empty. Would love to take doors off some of upper cabinets but due to dirt flying (dirt/gravel driveway) had to abort that idea. We have neighbors behind us that share the driveway. Do you like your tile counter top? So many people I’ve asked say tile counter tops are a menace, yours looks so clean and gorgeous, the tan color is very nice. Does it take lot of extra work to keep it clean? I Love your Ball Jar sign over sink. I went looking for ball jars have printed out but right now can’t find them so I could make sign like that. Your stand with the metal baskets is great, I love metal baskets. 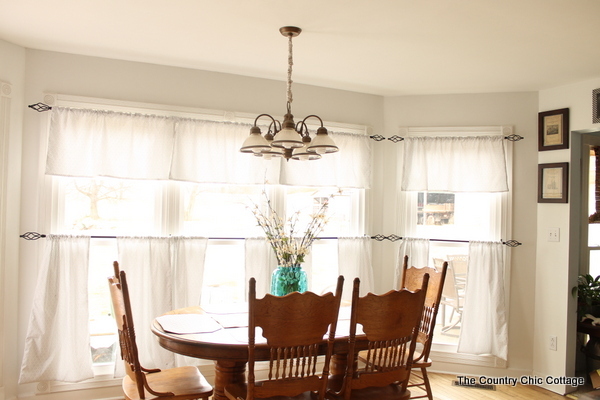 I made some new curtains for kitchen and master bath this week out of vintage table cloths. Have stored them for too long, thought it was time to do something with them, have made pillow covers and table runners with parts of them last year or so. Just know I love how new curtains look, so cheerful and Springy. Enjoy rest of week, before we know will be weekend again. Hi Jane! Yes the glass was in the cabinets when we moved here. I must say I love them! I absolutely HATE the tile counters. Right now I am saving for a solid surface. Crossing fingers to have a post on that this year! You accessories look amazing- the kitchen looks warm, comforting, and I could totally spend hours there! I love the “country chic” rustic look! I love the kitchen! Thanks for the giveaway! I love the color of the jar. I love the Wire cart with the baskets! I need one of these carts to help me get organized in the kitchen! I love the look of your kitchen-rustic and a country feel! Love all the rustic touches — I’m obsessing over those galvanized bins you found on amazon! Just beautiful – I love every little bit! And that pallet sign – I MUST have that! Pinned! That rustic look is super nice.. I’m a fan.. and thanks for the chance to win! Love the galvanized bins and wire cart! 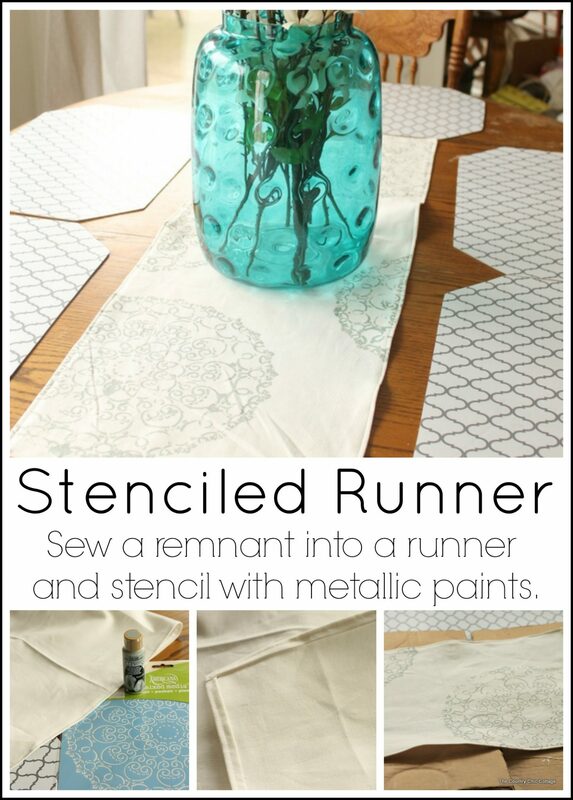 I love the stenciled runner! I love the white kitchen! Love the storage items used but I especially love the coke crate and jars! Love your kitchen! Thanks for the giveaway! Loving the rustic look, and I really love the mason jar hardware organizer! Oh I love what you did! Looks so neat and organized! The wire cart it wonderful! I also really really love the Better Homes and Gardens Silhouette Wall Clock!! That is so cute!!! I love the colored glass jar, very pretty! What great décor! I love the wall clock. It’s very elegant and classy looking! Like the placement idea. I can never find ones I like. Your kitchen looks like it would feel like home. Love the flowers and the vase. 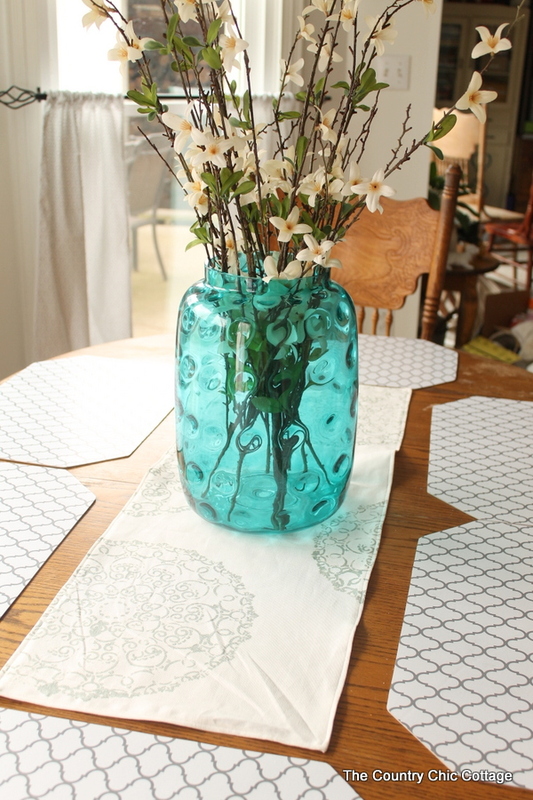 Love the stenciled table runner and ball jar painting – everything looks great. I’ve been trying to convince my husband to paper the backs of our glass front cabinets. Maybe this will convince him – love! I love the placemats and runner. I love the way that you put everything together. Nice! I love your centerpiece and placemats. You did a good job!!! I love the mason jar hardware organizer. 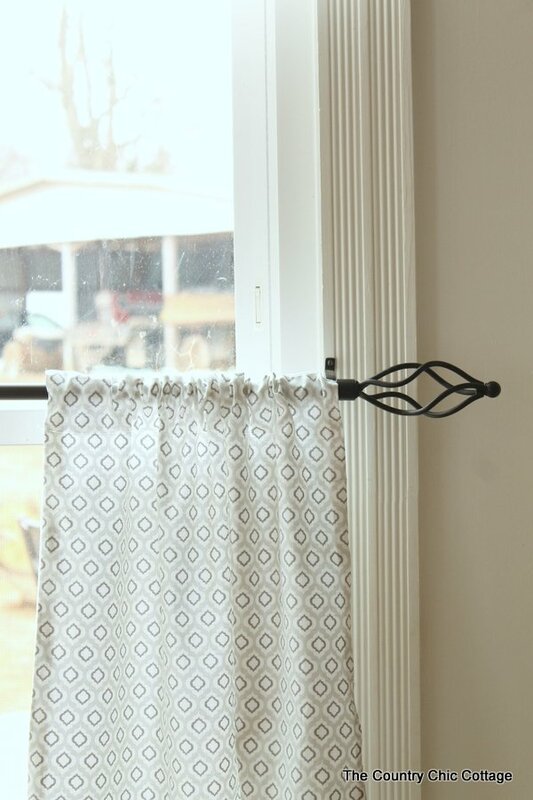 I am amazed at all the great BHG products they have at Walmart… I love their galvanized steel buckets for the kids toys and they have some curtains in blue that I really love for the living room as well. The 6 drawer wire cart also looks great as well. i am in love with your kitchen,wished mine was beatiful like yours;-).. 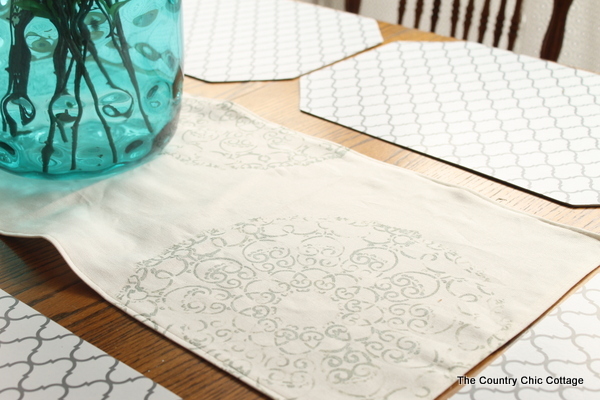 I so want to make a stenciled runner. Looks fab. Thank you so much for the opportunity. I may have some cheap plastic/vinyl placemats that my mom gave me a long time ago that this shelf liner would work with. I love the place mats. Your style is gorgeous! I just love what you have done with your place! I just love the Mason Jar sign you have behind the sink. 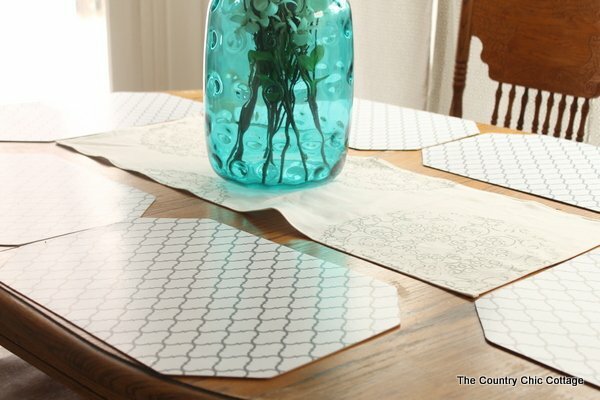 I love the placemat idea! Very smart! Love this line! Everything is so pretty! Your kitchen is very pretty. I spent the longest time on the placemat solution. Like, why haven’t I thought of that? Love all your windows, too. I adore the rustic farm house look. It creates a relaxing atmosphere and really feels like home. You decorate your kitchen like I have always wanted to decorate mine! I think your kitchen is gorgeous! You’ve done a great job. I need more of an ‘eye’ for things like you have. So glad you found it! I love the baskets! I can’t wait to see your studio!!! 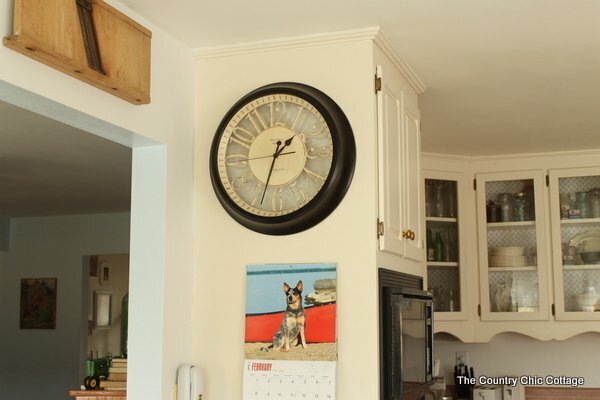 I love the accessories of these kitchens, particularly the clock in the kitchen above. I’ve been looking for something just like that. I also like the mason jar piece behind the kitchen sink. We are handy with word working and love making pieces like that. Will have to get hubby to do the same for me, LOL!